This post contains some affiliate links. This means that if you decide to click on the link and make a purchase, I might receive a small commission that helps me keep the blog going and developing free recipes for you all. Thank you for your support. Did you ever wonder if healing wasn't all just food and generally looking after yourself? Like, if something deeper was somehow involved? So I started to look for answers, away from food. I learned about Taoism, which encourages us to go with the flow in life and not worry about little things. I took up mindfulness, which comes naturally to me nowadays, although I remember in the beginning it felt a lot like clumsily re-programming my brain after so many years of anxiety and worry. But I got there in the end. I loved these two aspects - Taoism and mindfulness - but I was looking for how I could apply similar philosophies to healing, and was there anything I could do to heal my psoriasis? Sounded a bit crazy, but seeing as it had already calmed my mind so much, it had to be worth a try to get it to help heal my body, too. And then Anne Angelone brought out a new ebook called If The Buddha Had an Autoimmune Disease. As I flicked through, I realised, wide eyed, that everything written on the page seemed to make absolute sense, and I felt that a lot of it applied to me and my psoriasis. The book is a light-hearted look at Buddhism, and in it, Anne asks what the Buddha would say if he were diagnosed with an autoimmune disease. How can we relate what's going on within us to what Buddhism tells us about how best to live our life. Can we relate the teachings of Buddha to advice on healing chronic illness? The book is written in a really easy to read format - I read the ebook, so could quickly and easily switch to the relevant parts you want to read about, if you're looking to go over a particular section again, although it's also available as a paperback book. The language is down to earth and really easy to understand. In the ebook, Anne talks about the need to let go of any built up negative feelings of regret, jealousy, embarrassment - basically anything that elicits a stomach-turning, negative response. You know how you can go over something now, in your mind, that was awkward or embarrassing to you 10 years ago? You need to let go of that. She also talks about how mindfulness can help. And how cultivating a sense of joy in your life has really been shown to have a positive effect on the brain and stimulates the chemicals we need to heal and stay healthy. This ebook was a proper wake up call for me. Because while I've been patting myself on the back thinking I had mastered mindfulness (and I really feel a lot better for it), there were areas where I could see that I was slipping and also I could identify negative feelings I've been holding onto from events even decades ago. I love how Anne tells you not only the areas that might be good to work on, but also gives you tips and guidance on how to do it, with detailed explanations and exercises. 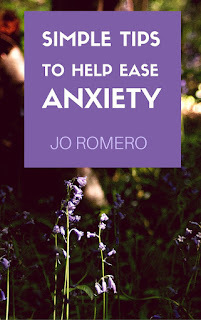 You might also like my ebook Simple Tips to Help Ease Anxiety. Click below to find out more.